Some readers of this blog may not remember – or be aware of what was – the world of media standards before MPEG came to the fore. Thirty years ago competences were scattered in ISO, IEC and ITU in ways that may appear illogical today but responded to the logic “I and my industry peers gather in one place and develop standards for our own needs”. For instance, there was a committee in charge of audio recording, another for cinematography and yet another for telephony speech, not to say about photography, set top boxes and more. You can get a complete picture here. The logic driving the licensing of the necessary technology was a consequence of this mindset. A company that had developed and marketed a successful product would bring the specification to the appropriate committee, get a stamp on it and license the technology to all companies wishing to practice the standard. As everybody “spoke the same language” the licence would naturally be configured in the way all practicing entities would expect it to be. Then came MPEG and all these committees either disappeared or got reconfigured. The scenario of many committees developing “many vertical media standards” was replaced by a single committee – MPEG – developing “single horizontal media standards”. Of course, after a quarter of century of technology and (partly) industry convergence, no one would think of creating standards for such old-style “verticals”. The fact that the MPEG-2 standard served the specific digital television industry and that most patent holders would actually practise it explains how it was possible to create the MPEG-2 Video (and Systems) technology and license it to those digital television users. Problems started to appear some 20 years ago after MPEG-4 Visual (ISO/IEC 14496-2). The licence developed for that standard charged those streaming MPEG-4 Visual content for the duration of content streamed. The “IT industry” refused those licensing terms because they did not suit their business model. In response to this void a number of companies offered – with alternate fortunes – video streaming and other IT services. The MPEG-4 AVC standard (ISO/IEC 14496-10) fared definitely better because the AVC licence corrected the terms considered most outrageous by the IT industry while still satisfying the needs of the broadcasting and consumer electronics industries. In hindsight we should have expected that the licensing of the HEVC technology would find the difficulties we know. More than 15 years after MPEG-4 Visual and AVC, digital video is a technology used by many disparate industries. Still we are not back to the time of vertical standards as 30 years ago because the roles of the industries are now mapped to the layers of an ISO/OSI (or equivalent) model, not to separate non-communicating mutually agnostic silos. Licensing of ISO/IEC standards shall be developed outside ISO/IEC. I believe that item 5 of the patent policy should remain untouched and so should probably be items 4 and 3. But item 2 prevents MPEG from taking corrective measures if ISO/IEC receive an Option 2 patent declaration against a standard that is intended to be “royalty free” or an Option 3 declaration against a standard that is intended to be FRAND, if the declarations fail to identify the claimed infringed technology. ISO/IEC should allow the development of international standards that satisfy a business model that a committee freely adopts. This requires that the committee should have the means to remove patents from a standard that a third party does not wish to be used in support of the committee’s business model. I do not have to say that a committee that adopts a business model is not developing a licence. Indeed we are simply recreating the situation of 30 years ago when each committee operated according to the shared business models of the industries populating it. In an earlier post I described the “crisis” and how it was created, and hinted at possible ways to solve this crisis and avoid possible other future crises in other areas. As I remain skeptical that the crisis will be overcome, I want to remove any doubt about who should be blamed for the failure, certainly not MPEG. The General Assembly is the ultimate authority of ISO and meets once a year. 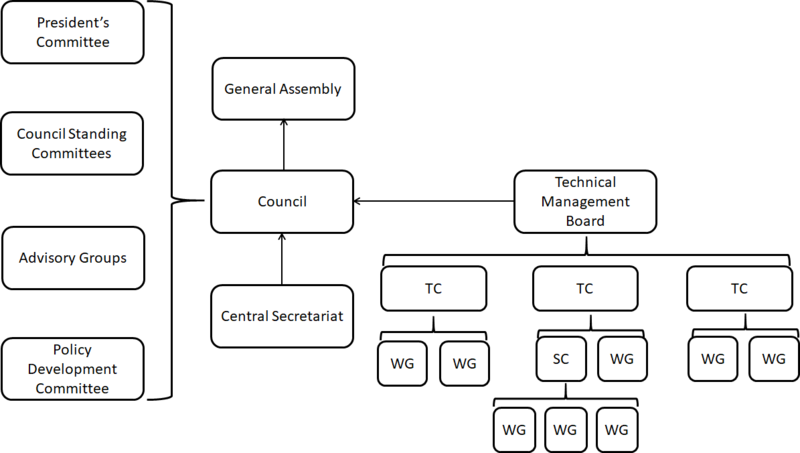 The Council is the core ISO governance body made up of 20 member bodies and other officers. It reports to the General Assembly and meets three times a year. The Technical Management Board (TMB) manages the ISO technical work and is responsible for the Technical Committees (TC). The TMB reports to Council. Technical Committees are in charge of developing standards. Nominally there are 314 TCs, but some are inactive or disbanded. Of particular relevance is the Joint ISO/IEC Technical Committee 1 (JTC 1) on Information Technologies established in 1987 by combining relevant activities in ISO TC 97 Information processing systems and in the International Electrotechnical Commission (IEC). JTC 1 is the largest TC in ISO and by itself manages ~1/3 of all ISO standardisation activities. JTC 1 is organised in Subcommittees, the latest of which is SC 42 Artificial Intelligence. Some SCs have been disbanded. The size and importance of ISO require rules that are contained in the ISO/IEC Directives that all entities in ISO are bound to follow. These are periodically reviewed. The Moving Picture Experts Group was created in 1988 as an Experts Group of Working Group 8 of JTC 1/SC 2 then called Character Sets and Information Coding. MPEG operatedin parallel to the Joint ISO/ITU-T Picture Experts Group (JPEG). In 1991 JTC 1/SC 29 Coding of audio, picture, multimedia and hypermedia information was created and MPEG became its WG 11 “Coding of Moving Pictures and Audio”. MPEG develops highly sophisticated standards and the typical attendance at its quarterly meetings is 400-500 experts. Therefore MPEG is organised in Subgroups: Requirements (what MPEG standards should do), Systems (media system level standards), Video (video coding standards), JCT-VC (HEVC standard), JVET (future video coding standard), 3DG (3D graphics coding standards), Tests (testing the quality of MPEG standards) and Communication (promotion of MPEG standards). JCT-VC and JVET are joint with ITU-T SG 16 Q6. This is a probably unique organisation in ISO, but it exists because standards for media systems require a strong interaction of its components. Because of this MPEG holds several joint meetings where relevant subgroups discuss and agree on matters of common interests. The ability to develop complex digital media standards is one of the reasons of the success of MPEG standards in the market. Breaking up MPEG would deal a fatal blow to the ability to create valid standards. There is a fundamental operational difference between ISO Working Groups on one side, and Subcommittees and Technical Committees on the other. SC and TC decisions are based on national votes (where e.g. Luxembourg and United States have one vote each), WG technical decisions are made by consensus. Far from being a constraint, consensus-based working ensures that MPEG standards are technically sound. As stated in my earlier post MPEG has been developing standards having the best performance as a goal, irrespective of the IPR involved. This approach has produced the best technical – and usable – video coding standards until AVC. No longer so with HEVC. It is not that there are many more patent holders in HEVC than in AVC, but the patent pool creation mechanism seems no longer able to deliver results. In my earlier post I have provided some ideas on how the MPEG standard development process can be adapted to deliver standards in a form that facilitates the development of licences. None of these ideas can even remotely disadvantage proponents of good video coding technology. The point is that decisions in the MPEG working group are to be made by consensus. So it is entirely in the hands of MPEG members (and also ITU-T, in the case of joint video standards) to agree on an effective way of streamlining the MPEG video coding standard development process. Unfortunately this is only the tip of the iceberg. The fact that almost the same companies have been unable to agree on an HEVC licence when 12 years before they had been able to agree on an AVC licence shows that the patent holder environment is changing. The result is that the nice “ISO consensus” practice may no longer ensure that Option 2 standards can be developed and the MPEG experience proves that Option 1 standards cannot be developed. Of course the work of developing technical standards must be done using the “ISO consensus” practice, but MPEG must be able to access the high layers of the ISO hierarchy without shields. Even if there were no other good reasons, this should be achieved because MPEG is the largest working group in ISO, larger than most if not all JTC 1 Subcommittees and of most ISO Technical Committees, producing more standards than most ISO entities. The reader should not think that I am rasing the “MPEG TC” issue because of an ill-conceived desire for “promotion”. Over the last 30 years I have been approached by several National Body representatives who asked me to raise the MPEG status in ISO. I always declined because at the time I thought that the “MPEG WG” status was just OK.
On a hindsight. not acting on those proposals was my mistake.